Mahi-Mahi (Coryphaena hippurus) (aka Dorado, Dolphin, Lampuga, Lampuki, Lapuki, Maveriko) If you’re interested in catching super-strong, beautiful, not-too-choosy, leaping fish, here ya go. These are the saltwater equivalents of bluegills, except they jump, and they get big. Like as big as your aging retriever. The common English name “dolphin” causes much confusion and lots of hand-wringing. Let’s be clear: this fish is not related to the marine mammal also known as dolphin (family Delphinidae). This distinction is completely obvious to anyone who’s seen the fish (or the mammal) in person, but we just want to be clear that we’re not angling for Flipper here. Dolphin have a couple of regional names. In Mexico they’re dorado. In Hawaii, they’re mahi-mahi (meaning “very strong,” an apt appellation). We’re going to stick with that name from now on. Mahi-mahi are one of the most widely distributed fish in the ocean. They are in just about all tropical and sub-tropical waters. Mahi are an excellent fish to target on the fly because they are incredibly acrobatic, beautifully colored, strong, aggressive fighters – and they’re plentiful. Plus, they are fantastic table fare. Here at FFBH, we’re always reluctant to suggest that the objects of our passion should be treated as food. But, according to SeafoodWatch.org, mahi are one of the very best fish to eat, in terms of sustainability and environmental impact. OK, off our high horse. Quick answer: anything and everything. But for our purposes we need to focus on baitfish. Flying fish, sardines, anchovies, all the standard fare. Squid are also part of the mahi’s diet, but we’ve never been in a situation that absolutely required a good squid imitation. (No doubt that those situations exist, though.) They feed on anything they encounter, but target flying fish, squid, crabs and smaller fish including baby mahi. They can be found anywhere offshore but are most often found in rips or current lines with floating debris. Mahi-Mahi Distribution, Habitats, & Habits Mahi have a long dorsal fin (somewhat sail-like) extending almost the entire length of their body. They are also known for their dazzling colors. It’s an amazing thing to see, but a fluorescing blue mahi cruising around the boat will turn an absolutely astounding yellow when he’s lit up – eg, excited by your fly, or when hooked. The transformation is incredible. (That’s why you don’t see pictures of anglers holding mahi in their aquamarine colors; somehow, when they get stressed or excited, they go yellow.) Mahi are very fast growing fish, and they spawn frequently (2-4 times annually). Mahi sexually mature by 6 months of age and typically live for 5-6 years. They’re found in waters from South America to the Caribbean, in Florida coastal waters and as far up the east coast as New Jersey (in the summertime). They can also be located all the way across the world in Hawaii, Australia and Asia. Most mahi caught in Florida and the Bahamas will be in the 5-15 lb (1-7 kg) range. However, down in Costa Rica and Panama the sizes begin to increase and you could hook up on a 20-30 lb (9-14 kg) bull fairly regularly. The west coast seems to produce the largest mahi weighing in around 35-45 lbs (16-20 kg) from Hawaii, Australia and the western Pacific waters near Asia. Mahi are voracious eaters. In the Atlantic, there’s a good chance that if you find mahi you will also encounter bonito, false albacore and other tunas. For that reason we don’t recommend anything less than a 7-weight rod. Use an intermediate line, or a fast sinker. We usually start with a 10-weight to see what’s in the water. More often than not we quickly move up to a 12-weight. These fish’s strength really cannot be overemphasized. In the Hawaii area, mahi are much bigger and stronger. You really shouldn’t start with anything less than a 12-weight. Here’s a good general plan: when fishing for billfish, have your 14-weight ready for marlin or sailfish. Set this rig up with a popper or a big streamer. And then have a 12-weight set up with a streamer like a Sea Habit or Eat Me for mahi in case they show up. More often than not, they will. 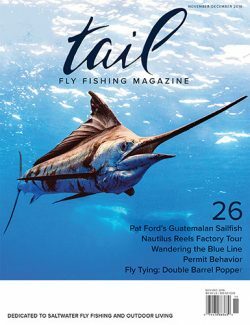 Flyfishbonehead – Fly Fishing in Saltwater, we make saltwater flies, saltwater fly tying videos & Tail Fly Fishing Magazine. Mahi are attracted to rip lines with floating sargassum weeds because small bait fish will hide from their predators beneath the grass. Sargassum weed lines aren’t the only thing that concentrates mahi. Anything that floats on the surface in blue water will attract small bait fish and eventually mahi will show up to feed on them. Fishing for mahi doesn’t have to be difficult but it does require some knowledge and know-how to get on them successfully. A couple of things to keep in mind when targeting mahi: Mahi like structure! Find a weed line or floating debris and cast your fly to the edge of the weed line and strip parallel to the weeds or debris. If you don’t get a chase or a hook up in a few casts then they probably aren’t there. Chum works! The key to fly selection is matching size and color of the fly to the natural food being eaten. Go smaller and sparser; especially sparser when in doubt. In most cases you’ll want to imitate a sardine or other small baitfish. Mahi are also not shy about eating their progeny, so yellow and green baitfish patterns work well. Small bait fish or popper patterns, from two to four inches, are often the way to go. We also like a small squid pattern or epoxy fly. Clouser minnows work well, as do Crease flies when conditions are right.